Getting ready for an afternoon of Kayak fishing on the beach in Waveland. Kayak fishing is all the rage along the Mississippi Gulf Coast. 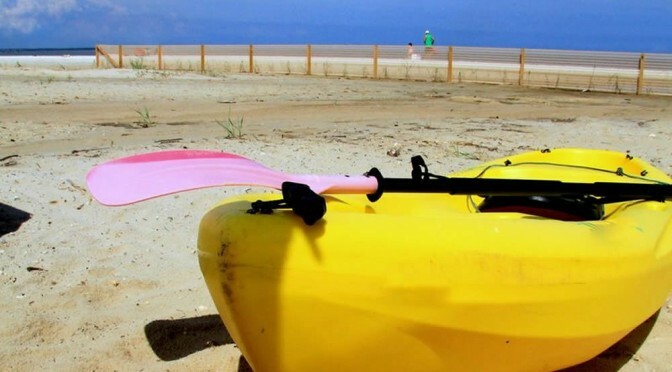 Waveland has great beaches that are easy for launching a kayak for a fishing journey. Many people fish on the reefs in front of Saint Clare’s Catholic church. There is also a group of kayak fishermen that enjoy fishing in the shade of the Waveland Fishing Pier. Since the pier is currently closed, only the kayakers are catching the fish at the pier.